Born in Benton Harbor, Michigan, Sinbad grew up telling jokes to his three brothers and two sisters. The image sticks: Sinbad the wild child, off-the-wall Sinbad who would do anything for attention, free as the wind, an unpredictable force that can’t be harnessed, and always willing to pay any price, looking for laughs. Sinbad doesn’t tells jokes. “I don’t know any,” he admits. Instead, he stalks the stage, telling real-life stories. He doesn’t deliver payoff lines; he slam-dunks them! His comedy is large, physical, and impetuous. Psychologically, he jams us, poking holes in our lifestyles. His stories mirror our foibles. His is the explosive energy of the neighborhood; his phrasing is manic, musical and right on time. He doesn’t write his material, he relives it as he remembers it. Sinbad made his big screen debut in the 1991 gridiron comedy “Necessary Roughness.” His other motion picture credits include starring roles in “Houseguest,” “First Kid” and “Jingle All The Way” and a cameo in”Coneheads.” He was the voice of the canine Riley in “Homeward Bound II.” On television, he starred in the title role of the “Cherokee Kid” on HBO, and was the star and executive producer of his own acclaimed Fox TV sitcom, “The Sinbad Show” and “Sinbad’s Summer Jam Weekend II” airing on HBO. “Sinbad’s Summer Jam” won the prestigious NAACP Image Award consecutively for two years in the “Most Outstanding Variety Series/Special” category. Sinbad transcended into late night talk with ease, creating quick repartee with any guest. “When you get the opportunity to get into business with someone like Sinbad, you don’t pass it up,” said Quincy Jones. 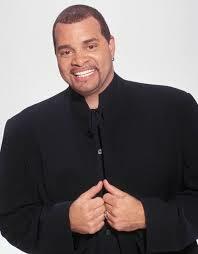 “He is a veteran performer known for his unique comedic voice and larger than life personality.” Sinbad hosted “Vibe” from 1997-98. Sinbad, who has built a loyal following with sold-out comedy shows and has gone from being one of America’s best-loved and funniest comedians to national stardom on television and movies, now brings his observations to the printed page. From love to layaway, parenting to primping, weight loss to the World Wide Web, “Guide To Life (Because I Know Everything)” certainly has something for everyone. This book was published by Bantam Books Hardcover in April 1997 and Mass Market Paperbacks in May 1998. Sinbad finds time for humanitarian and community services. Working with The Children’s Defense Fund and Omega Boys Club has helped him to continue to be more aware of the needs of children. In march of 1996, Sinbad accompanied the First Lady Hillary Rodham Clinton on an official visit to Bosnia and other European stops to provide comic relief to U.S. peacekeeping troops. Sinbad is as recipient of the Harvard University’s 1997 “Artist of the Year” award and the 1994 “Candle” award from Morehouse College honoring his excellence in Arts and Entertainment. With a long-standing interest in technology, Sinbad has served as a spokesperson for the National Action Council for Minorities in Engineering (NACME), which encourages minorities to pursue studies in science, math and engineering. Sinbad is in the business of working with family – his brothers’ Mark (personal manager), Michael (financial consultant). Donald (sound technician/photographer) and sisters’ Dorothea (director of development/road manager) and Donna (publicist). Moreover, it is his family ties that encourage his clean, animated and hilariously funny comedy that is well received by audiences everywhere. Do you want to hire Sinbad? Directly request a quote. In 48 hours we can send you the availability of Sinbad If you would like to book Sinbad, Entertainment Booking Agency is the right place. We will offer you the best price and contact the management or we directly contact Sinbad. For corporate appearances or speaking engagements you can contact our agents and the will help you true the process. Tags: hire Sinbad, Sinbad booking, book Sinbad, Sinbad appearances, find more information on booking Sinbad for appearances, Sinbad speaking engagements, Sinbad endorsements/spokesperson, Sinbad appearance fees, Sinbad booking agency contact info, biography of Sinbad, Contact an artist booking talent agent find a speakers bureau that can book Sinbad, speaker booking agency for Sinbad, Sinbad booking agency, Sinbad booking for corporate event. EBA is one of the biggest entertainment booking agencies in the World. We book hundreds of celebrities, artist, athletes and speakers in a year. Important to know is that we are not claiming to be the management of Sinbad. We are not the official agent for Sinbad. Companies from around the globe book these artists and speakers true our company be course we have one of the biggest networks and we always have direct contact with the artist or the management. We help you to find the right celebrities for your corporate of private events. Please contact one of our agents to get free advice and we will help to get the world-famous artist on your party.